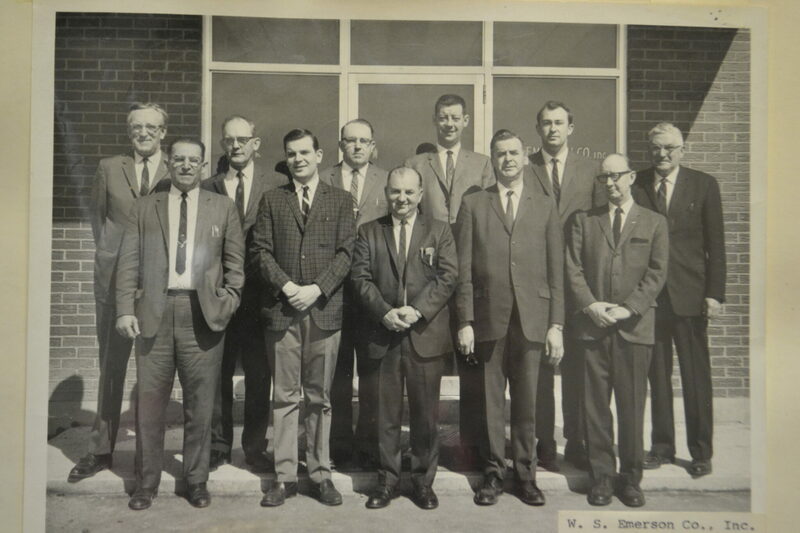 W. S. Emerson Salesman & Headquarters Group May 14, 1966. W.S. Emerson has been in the wholesale apparel business for nearly a century. Starting on Central Street in Bangor, Walter Emerson opened the doors for business in 1921. A family owned and operated business, W.S. Emerson started with “Uncle” John Vickery as one of Walter’s first employees. John became general manager in 1933. The sales team traveled throughout Maine selling national and private apparel brands to area retailers. Since W.S. Emerson was growing rapidly, their need for more room became evident. Therefore, they purchased a four story brick building on Exchange Street in Bangor and called it home. “Uncle” John Vickery purchased W.S. Emerson in 1952, after the passing of Walter Emerson. He expanded the business by started his own retail stores while growing both his team and facility. Due to growth, the need for a larger space became first priority. Consequently, the current location at 15 Acme Road in Brewer, Maine, was chosen for construction of a new 30,000 sq. ft. warehouse that opened in late 1965. With a larger team John Vickery brought his brother, Winslow Vickery, onto the management team. While working side-by-side, the brothers grew a corporate culture that emphasized family and hard work. The corporate culture was expanded when a new generation of Vickerys took over in 1982; Winslow’s sons, John and Russ, became President and Vice President. As a result, business flourished during the 1980’s and both the retail and wholesale divisions of the company expanded. Consequently, W.S. Emerson was the dominant name for wholesale apparel. When the 1990’s struck, so did the success of big-box retailers, which dramatically changed the business climate. In one year, more than 2,500 of W.S. Emerson’s retail accounts closed their businesses. As a result, reinventing the W.S. Emerson Company became Russ and John’s top priority. As demand for customized apparel in the retail and wholesale sectors was becoming main-stream, John and Russ saw an opportunity to expand. They used their strong relationships with suppliers and lead the team into creating customized apparel. First, in-house embroidery paved the road to success, quickly followed by screenprinting. Graphic design software was added to expand the creative design process. In addition to growing with new technology, a 10,000 sq. ft. warehouse expansion was completed in 2003. In the early 2000’s, a Bridge Laser system was installed to produce customized appliqué work. Also, a digital printing department was developed to create full-color spectrum designs. As a result, W.S. Emerson grew into a full service custom apparel wholesaler. In 2013, John Vickery Jr. took over the helm as President. John, Russ Vickery and Betsy Vickery, all have a hand in continuing the corporate culture of a family business. Today, the company employs more than 40 full-time individuals each of whom contribute to the success of W.S. Emerson.